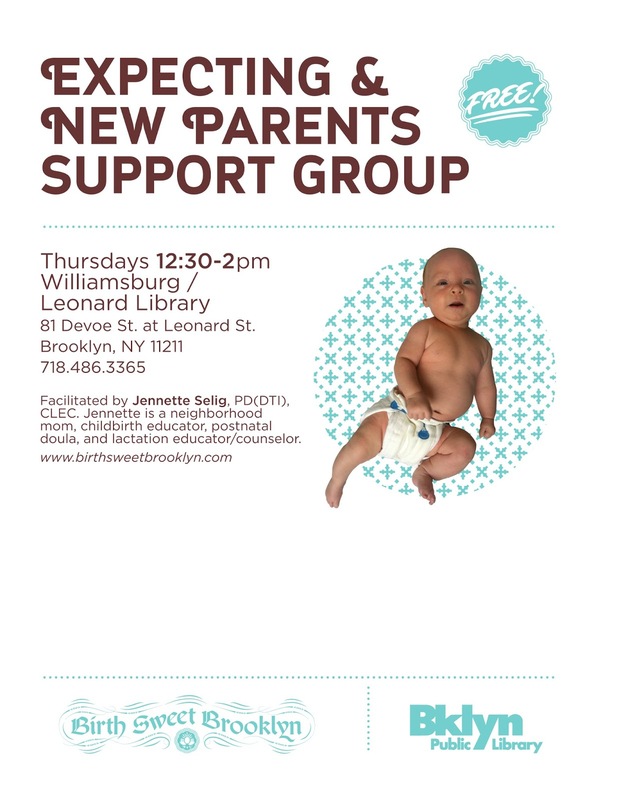 Birth Sweet Brooklyn: Free New Parent Support in North Brooklyn! 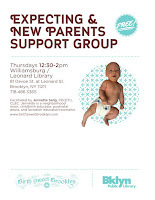 Thanks to the generosity of the wonderful staff of the Leonard Branch of the Brooklyn Public Library, I am now able to host a FREE support group for expecting and new parents each Thursday (excepting holidays on which the library is closed) from 12:30pm until 1:30 or 2pm. This is a great way to meet other parents, make "tummy time" more interesting for a newborn, strategize about sleep or feeding with a lactation counselor and your peers, or just get a break from the "cabin fever" you may be feeling at home with a little one. Is your baby not yet born? Expectant parents are always invited to join us, whether birth parents, adopting, or otherwise. Older siblings are also welcome, especially if that makes it easier for new or expecting parents to attend. Please try to arrive between 12:30 pm and 1:30 pm, as -- if no one arrives by 1:30 -- I often leave for the afternoon at that point. Otherwise, we have the room until 2pm. The Leonard branch location is in Williamsburg, Brooklyn, near the L and G subway stop at Lorimer/Metropolitan and near several bus lines, including the B43. Share our flier and spread the word!